• The plaque must be placed on an exterior wall of the building, or wall of the property, so that it can be seen by the public, if possible. Any divergence from such placement must be approved by Historic Alexandria Foundation. • Historic Alexandria Foundation retains ownership of the plaque. • The owner agrees to notify the Board of Architectural Review to approve such changes. 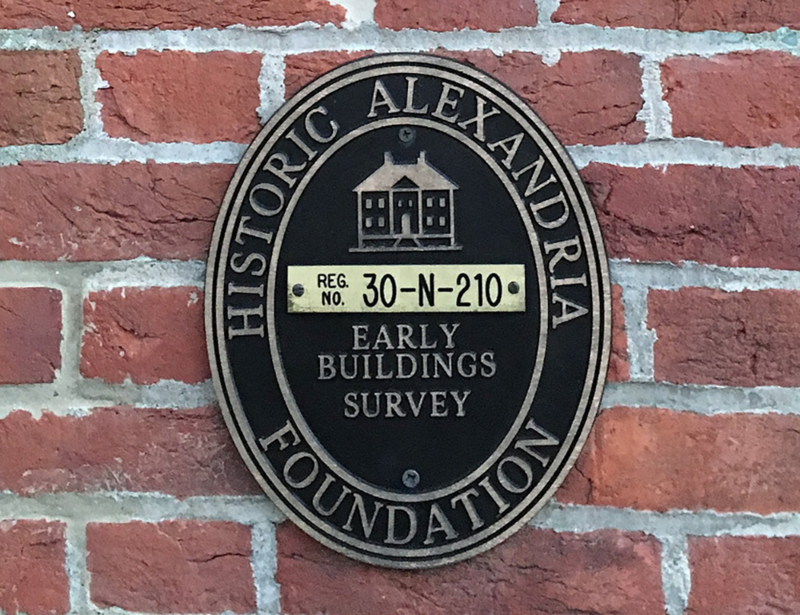 • Historic Alexandria Foundation reserves the right to remove a plaque if a property's architectural integrity is diminished by future alterations, even if the alteration was approved by the Board of Architectural Review. Your application may be submitted electronically, along with digital pictures. One paper copy of the application and a CD should be mailed to the HAF office. Please review the sample Building Description and History taken from a successful application. Note that the description covers period, style, materials, number of stories, and distinguishing architectural features. Note that the history indicates who constructed the building, what is known about its early owners, and dates of any changes affecting the building. Such information should be documented by the relevant sources (listed on the application form). Do not submit a complete house history, but document your references. Research materials are available at the Local History/Special Collections, Queen Street Library; at Alexandria Archeology, 3rd floor, Torpedo Factory Art Center; and at the city’s Archives and Records Center. The Committee now requires digital color pictures of all sides of the building. Please attempt to take pictures when foliage does not block clear views. After submission of your application, HAF staff will communicate with you about whether your application is considered complete, and will give you an approximate idea of the timing of the application process. Applications are reviewed by the Plaque Committee and its professional consultant on a quarterly basis. If your application is approved by the plaque committee, you will then send in the $800.00 fee for the plaque, along with a signed copy of the Plaque Agreement to the HAF office. It is customary for plaques to be awarded at the HAF Annual Meeting/Garden Party, held in early June. If a plaque is not awarded, but the committee makes suggestions about modifications to your building to make it eligible, you will be expected to resubmit your application with updated photographs upon completion of the work. Please remember that you must have any work approved by the Board of Architectural Review (BAR), and that work approved by the BAR does not necessarily mean that a plaque will be awarded by HAF. Replacement plaques cannot be supplied if an existing plaque is removed, lost or stolen. In such an event, the property owner will be required to submit an original application, pay those fees required for an original application and meet the same criteria as is required of any other new applicant. A HAF bronze plaque signifies a historic building and a commitment to maintain its character for the future. 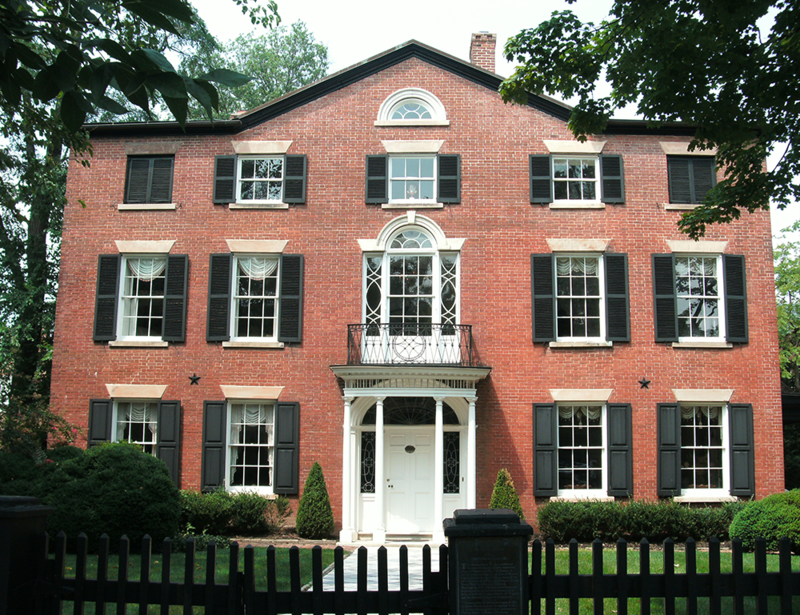 This house on the 700 block of Prince Street reflects the neo-classical influence of Charles Bulfinch.